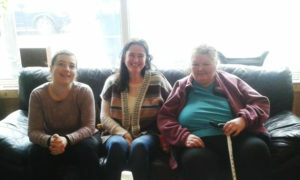 On 10 April 2017 CASE Central had the pleasure of receiving Resilience Project Worker Gemma Challenger, which concolidated a long relation between CASE and Brighton Regugee Radio. On this day Gemma met CASE Central’s volunteers, some of our Trustees and a number of our visitors and clients. The collaboration between CASE and the Refugee Radio started two years before, when previous Refugee Project Worker Guy Hayes referred to us a EU national who risked homelessness and deportation due to the increasingly strict immigration rules. This client was saved from deportation and his life stabilised after prompt co-ordinated action from both organisations – and after a long legal battle stubbornly waged by CASE benefits advisers, the client obtained £8,000+ benefits arrears! Since this first, rewarding, contact with Guy, we have helped a few times the Refugee Radio with more legal and practical info. During the meeting of 10 April, Gemma informed us of a new initiative of the Refugee Radio, a psychological ‘Support Group’ for migrants and vulnerable people. Of course, people whose lives have been subverted by wars and human or natural disasters, who have been tortured and/or have seen the death of relatives or friends, is essential. And after the vote for Brexit in 2016 even migrants from the EU, so far considered ‘privileged’, need psychological help, as their future lives in the UK, and the integrity of their families have been put under question – these people have been kept in an anguishing limbo for already two years (to know more click here). Gemma has now told us about yet another of the Refugee Radio’s clients, an Eastern European man, who has been threatened with deportation after many years of life and work in the UK. We hope that together, besides helping individuals, we manage also to change the heart and mind of Britain and help creating a new, loving, welcoming, society.